Believers are in an uproar about an exhibit at the Glasgow Museum of Modern Art that invited viewers to add their thoughts about the Bible to the pages of the Bible itself. The offer was soon retracted, however, since many of the comments were critical of the Bible. No, don't just imagine that. Do it. The next time you go to a hotel that has a Gideon Bible in its drawer, get out some highlighters and mark the passages that should horrify and offend anyone with any moral sense. Make notes in the margins, inside the covers, and on the front page. And don't forget to attach a warning label. I think the Bible does a pretty good job of defacing itself through its stories. I do like the idea of the warning labels (I know FFRF has some, and other places do, too), but I think highlighting verses is a better idea. Yeah, I agree with you I am. The stickers are nice, but they're easily dismissed by believers as just unfair criticism from those awful atheists. But highlighted verses from the Bible itself? That's pretty hard to argue with. You either think it's a good idea, for example, for God to force parents to eat their children (Jeremiah 19:9) or you don't. And if you don't, then you've got a problem with the God of the Bible. I always thought it would be funny to put up a big jar somewhere that contained various horrific Bible verses in it that people could take with them. The jar would be nicely decorated and would read "Free Bible Verses. Please Take One." People could reach in for their Biblical inspiration and read all sorts of disgusting quotes from the Bible written on pretty paper. I prefer cutting the center out of the Gideon Bible and putting a bottle of liquor inside. It makes a great gift. 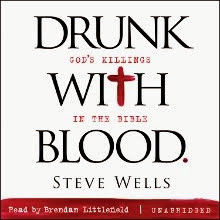 "When I check into a hotel room and send my free and unsolicited copy of the Gideon Bible or the Book of Mormon spinning out of the window, I infringe no law, except perhaps the one concerning litter." Did Stephen Harper put Jesus in his pocket?